Okay, the last time I was aiming to talk about black metal with In The Woods..., I got thrown a curveball, namely by the fact that record only barely stuck its toes in that genre while instead embracing more progressive and doom metal touches. But that didn't mean I was going to stop looking, and thanks to you all, I got a wealth of suggestions to work with to catch up for 2016. So on that note, let's talk about Saor, a Scottish black metal project that erupted out of the highlands in 2013 with their debut Roots, reportedly aiming for a blend of atmospheric black metal with touches reminiscent of Celtic folk. And hell, that seemed like the easiest way to get me on board since Panopticon brought in elements of country and bluegrass for that last trilogy of records, the last of which Autumn Eternal landed on my list of my favourite albums of 2015. So I was all set to like Saor... and unsurprisingly, I really did come to enjoy a lot of what I heard from both Roots and their 2014 album Aura, which balanced the relentless blur of tremolo picking with flutes, brighter acoustics, and a defiant soaring Celtic flavor in the melody lines. Now let me stress that I don't really think either record is better than Panopticon's trilogy - for as much as I loved the melody lines, the actual mixing of the black metal riffing and blast beats could feel a little sloppy, not quite always supporting the dramatic swell the way I'd like - but hey, this is a sound I'd like to see expand and if fine-tuning the details could get there, I had hope that Saor could really bring it on their release this year Guardians - was I right? Man, I was, because this album rules. 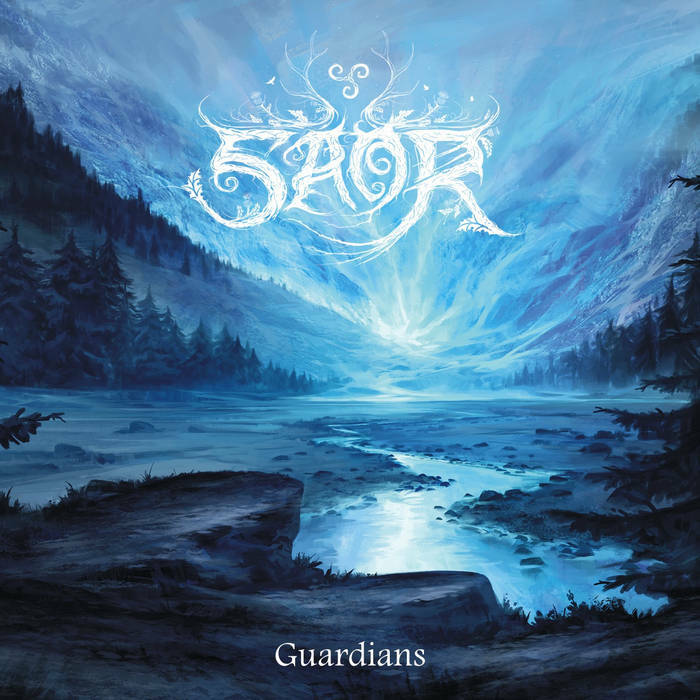 This was precisely the step I was hoping that Saor would take, not just an expansion of their black metal sound but also seeing their Celtic folk touches refined into the richly melodic tones that give their material such swell for me. And really, it's the sort of album that doesn't exactly require a lot of explanation: Celtic folk melodies, instrumental textures, and lyrics plus huge clouds of roaring black metal... even if members of Saor themselves consider this less black metal and more atmospheric or folk metal. And while it's probably true that I've got a love for Celtic melodies that goes back decades, this is the first record where it feels like the balance and fusion connects as strongly as it could, with some of the grandeur simply coming in the raw simple power of the fusion done masterfully well. So here we go: five tracks, each extending over ten minutes, pretty sparsely written all things concerned... in fact, let's get the writing out of the way first, because it's easily the least essential element here. Oh, it's solid as hell for what it needs to be - combined with frontman Andy Marshall's guttural delivery, these are words spat across the wilderness, shredded by the elements and human carnage. And yet this is not a record that wallows in darkness or stews in rage: the writing calls to mind ancient history and warriors who have returned to the earth but stood against the tides centuries earlier, where the wars transcended glory for something more. Hell, the clean vocals on 'Hearth' only further emphasize this - a reverent moment, standing for hearth and home in the face of whatever might come, with the weight of the ages behind them. This also leads to my one criticism of this record, in that the vocals feel mixed a tad low - Marshall has presence and power in his growled range, and this is the sort of mix where he could have commanded these tracks instead of stalked within them. And my god, it does, it absolutely does! Keep in mind my issues with Saor in the past were that the black metal guitarwork and blast beat intensity never was quite balanced properly on previous records, but those issues are pretty much resolved here, and that's before Saor opts to expand beyond just flutes for the Celtic touches to strings, fiddles, and more traditional instruments like the bodhran drum and - of course - bagpipes. Hell, it's those pipes that kick off the title track off the guitar layers, minor tolls until the tremolo riffs explode in, with blast beat drumming not far behind. And what's very telling is how well the mix is balanced - if the kickdrums aren't storming forward, the bass adds some firm presence. If the main guitar line takes prominence, the strings operate as melodic accents, and if the fiddles or pipes leap forward to carry the melody, the main guitar or tremolo riffs settle in the midrange or play counterpoint, all in creating that swirling, thick cloud of interweaving melody that has a sprawl that's nothing short of cinematic. Are there moments where I feel the transitions or tones don't quite pay off as well as I'd hope? Yeah, but they're minor - I do wish the riffs that open 'The Declaration' were a little thicker, and the opening movement of 'Autumn Rain' could have used a slightly smoother transition into the rest of the track, but again, these are minor gripes indeed! Compare to when the mix is willing to ease back, let the main guitar establish a melodic phrase that the song will then build off in swells and crescendos for the next few minutes - especially on 'Autumn Rain' and the final half of 'Tears Of A Nation'. Then there are the segments like the build off the bodhran drum off the spacious effects and ragged strings on 'The Declaration', or the smoky, acoustic-touched moments on 'Autumn Rain' that trades off melodies effortlessly, or that kickdrum-touched groove that drives 'Hearth' that leads into one of the best crescendos on the entire album as the guitar tones evolve and shift, trading melodic weight across tones from acoustics to electric to tremolo riffs, it's stunning. And that final segment on 'Tears Of A Nation', how the main electric guitar, pipes, acoustic touches and blast beat drumming hold the main melody stable as the backing atmosphere shifts and evolves the piece, allowed to fade gracefully as the bagpipes, tremolo riffing, and main guitar shift off each other effortlessly. On a compositional level, this record is so amazingly well balanced, it's breath-taking. In short, I'm not doing this record justice by simply describing this how well it shifts and soars - Guardians is a record that feels like you're on the back of a dragon, flying low over the sweeping hills and leading a great host beneath in a desperate charge. It's primal and organic - the production on the strings and pipes especially, they sound so ragged it's perfect - but ridiculously well-composed and balanced. It's a triumphant record, not the howling tranquility of Panopticon but closer to the thunderous swell of the best folk or power metal. In short, this is easily getting a 9/10 and the highest of my recommendations, especially if you're a fan of atmospheric black metal and are looking for some of the most powerful melodies you'll hear all year. Absolutely essential, so glad you all recommended this, definitely check it out - it's incredible.